This tutorial demonstrates how to integrate an existing system of record data source into the blockchain ledger. In this guide, we will build on the Developer Tutorial, extending it to bulk load records from a JSON text file data source to populate Participant and Asset registries in the sample 'Commodity Trading' business network. Node-RED is commonly used to rapidly prototype Internet of Things style applications, or to wire existing Internet services together. This tutorial uses the tutorial-network business network developed and deployed in the Developer Tutorial. Complete the development environment installation. This tutorial assumes the reader has some familiarity with Node-RED. The Node-RED website has an introductory video and a getting started link. The command output will show that Node-Red server is now running at http://127.0.0.1:1880/ - open this link in a Browser to see the Node-RED UI. The Composer Nodes for Node-RED are described here https://www.npmjs.com/package/node-red-contrib-composer and can be installed into Node-RED through the UI. On the Node-RED UI Menu, click Manage palette, the click on the Install tab. In the search modules field type node-red-contrib-composer, then click the Install button and on the confirmation dialog click the red Install button. The nodes take a few moments to install, and a message will be shown in the UI and in the terminal window where Node-RED was started. Verify that the nodes are installed by scrolling to the end of the Palette on the left of the UI - a new category called Hyperledger should be at the bottom with the three nodes. On the Node-RED UI Menu, click Manage palette, the click on the Install tab. In the search modules field type node-red-contrib-fs, then click the Install button and on the confirmation dialog click the red Install button. Verify that the fs file lister node has been added to the Storage category on the Palette. The image below shows what the completed flow will look like. Drag the nodes from the palette on the left onto the Flow. Double click on a node to edit the properties. In this flow the inject node is being used primarily to initiate the flow, rather than to inject data. In this flow the data will come from JSON files on disk. For the Start Folder, on Ubuntu Linux substitute <username> for the logged in user. On Mac adjust the Foldername to reflect your system. In the next step of the tutorial test data will be created in this folder. Use the full path of the folder - using the ~/ notation to indicate the user's home folder will cause an error. This node sets the filename variable for the next node in the flow. This node reads the JSON test data file into a String variable. Click the pencil icon to add a new Composer Card. Card Name - admin@tutorial-network This is the Hyperledger Composer node that will connect to the Business Network on the Fabric and submit the Transaction. After you have set the properties on all the nodes, Wire the nodes together as shown in the diagram above. Remember to click the red Deploy button to save the flow. Click on the left edge of the Start node to test the flow. In the previous step the flow has been run and the participants (Traders) have been added. Test data has been created for new Assets (Commodities) and a small re-configuration is required to add them. Double Click the Read JSON Files node and modify the property Start Folder to reference your commodities test data folder. Click the Deploy buton the save and deploy the change. Start the flow and validate that the Commodity test data has been added. Any Errors will be dislayed on the debug tab in the UI, and on the terminal window where Node-RED was started. 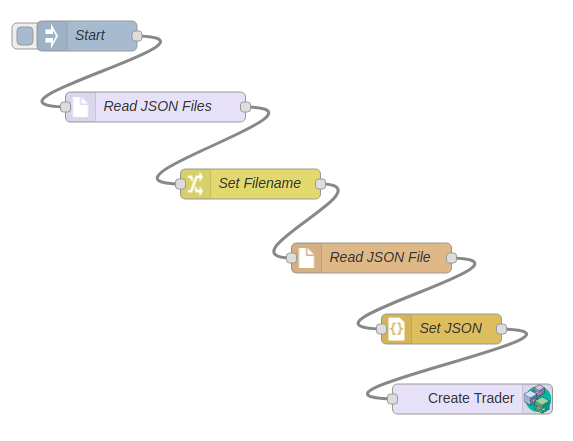 Incorrectly specified folder name in Read JSON Files Node. [error] [hyperledger-composer-out:Create Trader] Error: creating resource error Namespace is not defined for type org.acme.biznetttt.Commodity -- Errors in the test data - namespace errors or formatting errors in the JSON files. [error] [hyperledger-composer-out:Create Trader] Error trying to query business network. Error: Connect FailedFabric -- Containers not started - use docker ps to check. [error] [hyperledger-composer-out:Create Trader] Error: creating resource error Card not found: admin@exampleyz-networkWrong Business Network Card specified -- verify card name by using composer card list on command line.